Methane clouds are visible in this image of Saturn's moon Titan that was captured by NASA's Cassini spacecraft on May 7, 2017. The left-hand version of the photo features stronger enhancement than the right-hand version. 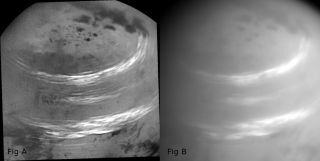 Wispy bands of methane clouds brighten Saturn's big moon Titan in a striking new image by NASA's Cassini spacecraft. Cassini took the newly released photo Sunday (May 7), when it was about 316,000 miles (508,000 kilometers) from Titan, NASA officials said. The 3,200-mile-wide (5,150 km) Titan is the second-largest moon in the solar system, trailing only Jupiter's satellite Ganymede in girth. Titan has a thick, nitrogen-dominated atmosphere and a hydrocarbon-based weather system; liquid methane rains from Titan's skies and flows across the moon's surface, collecting in seas and lakes (which are visible as dark blotches near the top of the new Cassini image). Titan is the only object beyond Earth known to harbor stable bodies of liquid on its surface. The $3.2 billion Cassini-Huygens mission — a joint effort involving NASA, the European Space Agency and the Italian Space Agency — launched in October 1997 and reached Saturn in July 2004. In January 2005, the mission's piggyback Huygens lander touched down on Titan's surface, becoming the first craft ever to land on a moon in the outer solar system. The Cassini orbiter, meanwhile, kept cruising around the Saturn system, studying the planet, its iconic ring system and its diverse collection of moons. But that work is almost done. Cassini, low on fuel, will wrap up the current "Grand Finale" phase of its mission with an intentional death dive into Saturn on Sept. 15. This maneuver is designed to ensure that the probe doesn't contaminate Titan or fellow Saturn satellite Enceladus — both of which may be able to support life — with microbes from Earth, mission team members have said.